We are proud to introduce you to some of our queens. The beautiful queen shown below is our Adore Cats Atria. Atria is a Seal Spotted Lynx Point (snow) Bengal with stunning blue eyes. She is incredibly soft to touch. 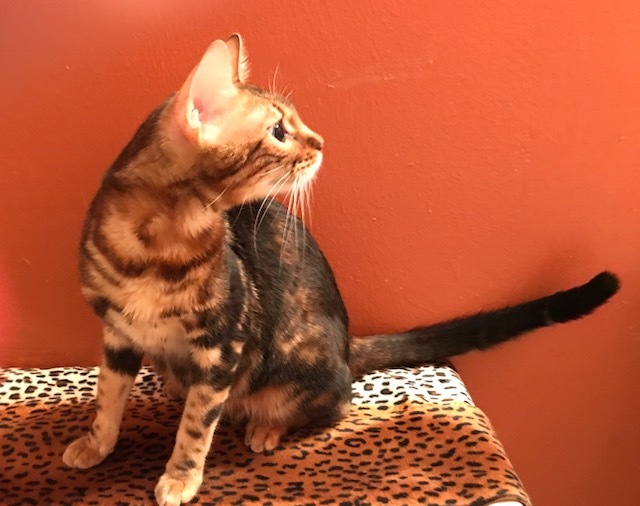 Her father is a Triple Grand Champion show cat. Her pedigree is certified by TICA and it includes Supreme Grand Champions (SGC), Quadruple Grand Champions (QGC) and more. Born and raised here, she is a very sweet female who loves to put herself in the middle of any conversation. She listens to what is being said and when there is a pause, she chimes in with her “cat comment” :-). She is delightful to have around. Atria is negative for HCM, PKD (N/N), FeLV and FIV. The our queen below is very special. Her registered name is Adore Cats Fine as Brandywine. We call her Brandy for short. She has lots of glitter on her very short, soft coat. She was born and raised here and comes from excellent bloodlines. She has a unique pattern and no rib bars. She is very playful and loves to tell you what she thinks :-). Brandy is negative for HCM, PKD (N/N), FeLV and FIV. 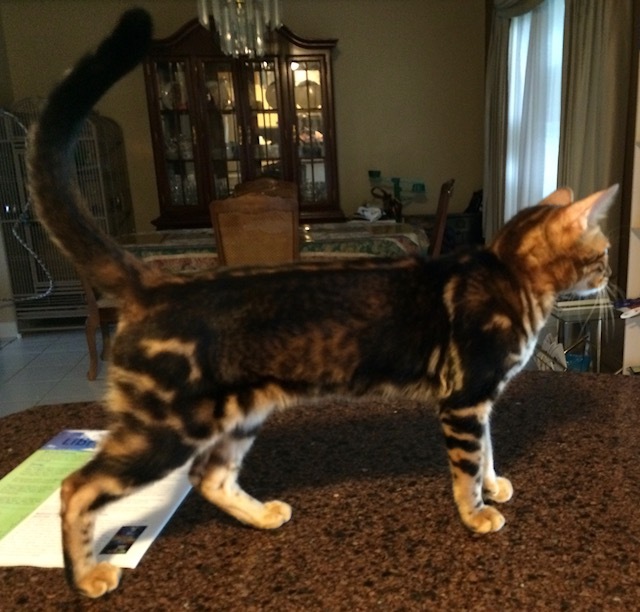 The queen shown in the photo below is a cutting edge, golden brown spotted rosetted female Bengal cat. She has lovely green eyes. Her registered name is Kanpur Unforgettable of Adore Cats. We call her Belle for short. 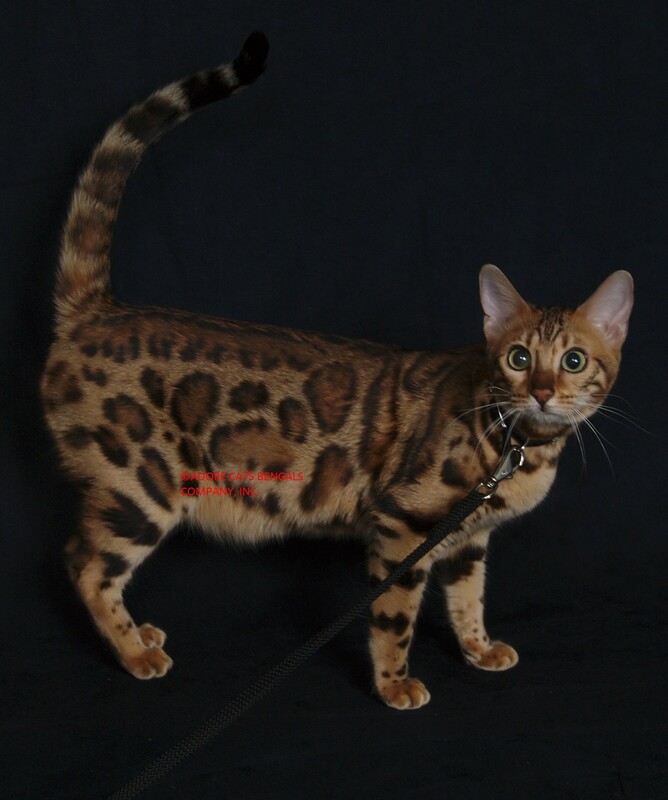 Her pedigree is certified by TICA and includes: Supreme Grand Champions (SGC), Quadruple Grand Champions (QGC) and more. She is negative for HCM, PKD (N/N), FeLV and FIV. She is so gorgeous she takes my breath away just to look at her. 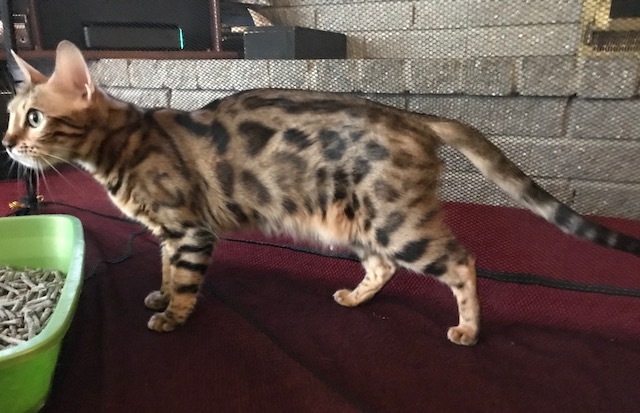 She has fantastic chain rosetting down both sides of her spine and where many cats have rib bars she has chain rosetting that goes all the way around behind her shoulder blades. She has a wonderful personality. She loves to jump up and ride on my shoulder where ever I go. She wants to be where people are so she can be in the middle of everything. My sincere thanks to Carl and Diana Smith for allowing me to have this awesome girl for my program. 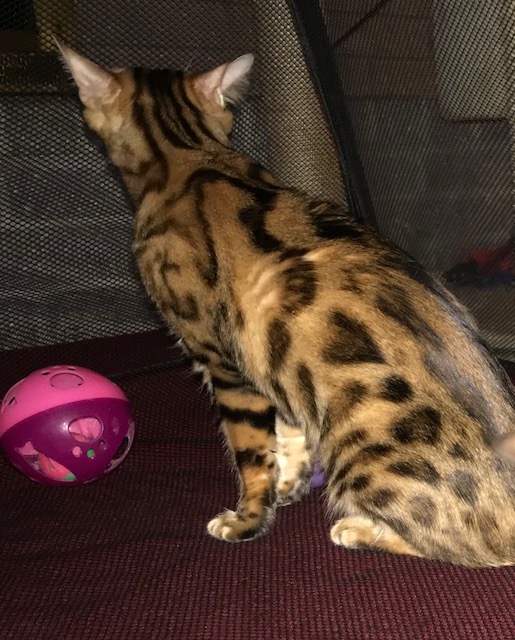 The photos below are of our female brown and black marble chaos patterned Bengal. Her eyes are a lovely light green. Her registered name is Kanpur Dark Corona of Adore Cats but we call her Cora. Her pedigree is certified by TICA and includes: Quadruple Grand Champions (QGC), Triple Grand Champions (TGC) and more. She is negative for HCM, PKD (N/N), FeLV and FIV. Cora is very active but she also likes to remind me if she has not been petted in the last few minutes and insists that I accommodate her :-). I gladly do so. We greatly appreciate Carl and Diana Smith for allowing us to have this special girl.